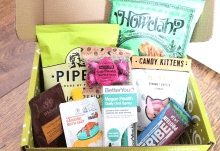 Pink Parcel are one of my favourite subscription boxes as they send you all of your femcare/sanitary essentials with a box full of beauty, pampering and food/drink treats. The words, ‘have a happy period’ certainly spring to mind! When you sign up to Pink Parcel, you can choose your favourite mainstream brand of sanitary protection in the form that you would like from a list of available options, and you can also select what date you’d like to have your box delivered so that you don’t have to make any last minute trips to the shops. 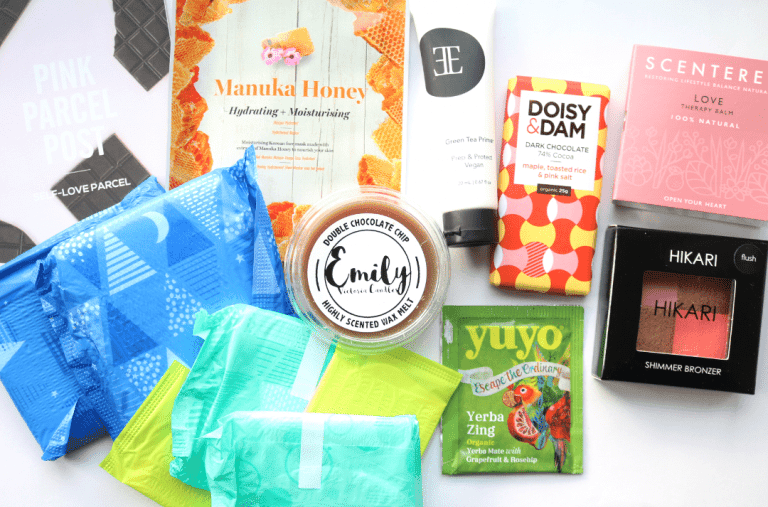 February’s Pink Parcel is all about self-love (well it is Valentine’s Day today after all!) and includes some amazing products. First up though, I wanted to show you the femcare products, which come packaged in handy little boxes and a cotton pouch bag. For my subscription, I chose Always pads and liners, but they also offer tampons or a mix of both if you prefer. There’s more than enough to cover you for the month and I usually find that I have a few pads spare at the end too. 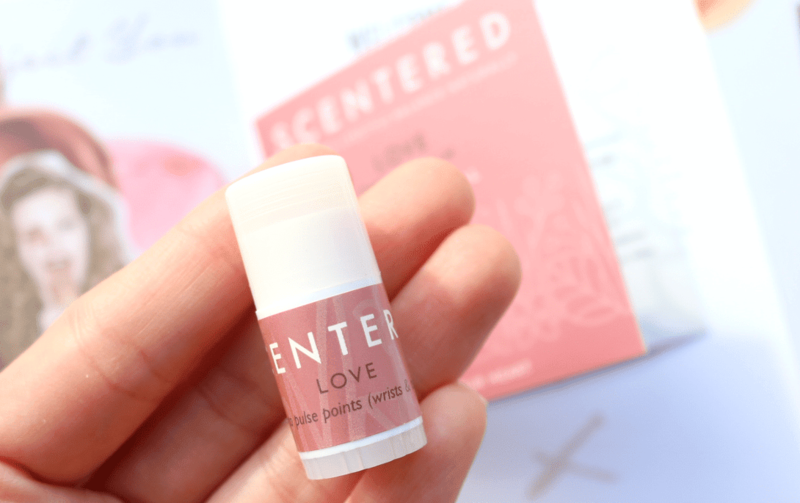 The first beauty product that I pulled out of the box was this adorable mini Therapy Balm from Scentered. It’s 100% natural and uses a blend of aromatherapy essential oils. In this case, it’s Rose, Patchouli and Cedarwood, which gives it a beautiful scent. These essential oils promote feelings of harmony, peace and love which is perfect for this loved-up month! I haven’t heard of this cosmetics brand before, but I’m happy to see that the formula is vegan-friendly and cruelty-free. I love trying out new primers and this one has a lovely texture and feel to it as it creates a super smooth base on the skin. It contains antioxidant-rich Green Tea extracts to protect the skin against the elements and makes makeup look flawless. A winner for sure! 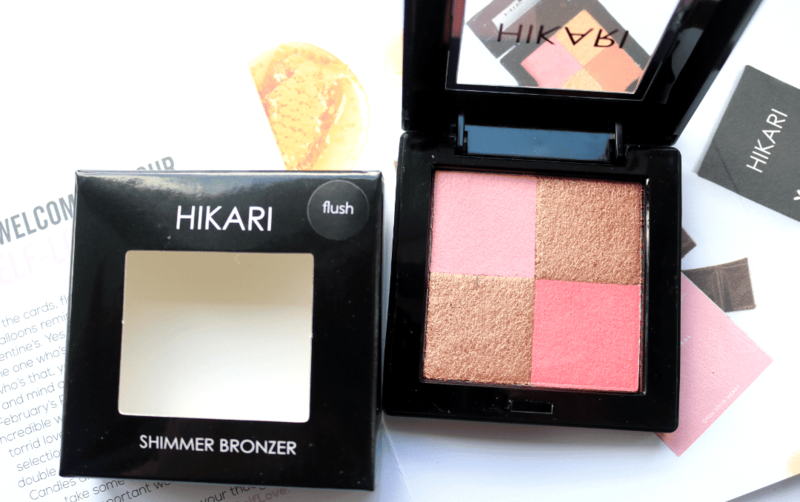 I was thrilled to see some makeup included and this Shimmer Bronzer from Hikari is absolutely beautiful! It’s very pigmented and gives such a pretty glow to the skin to brighten up a dull or tired complexion in a matter of seconds. The perfect winter pick me up! 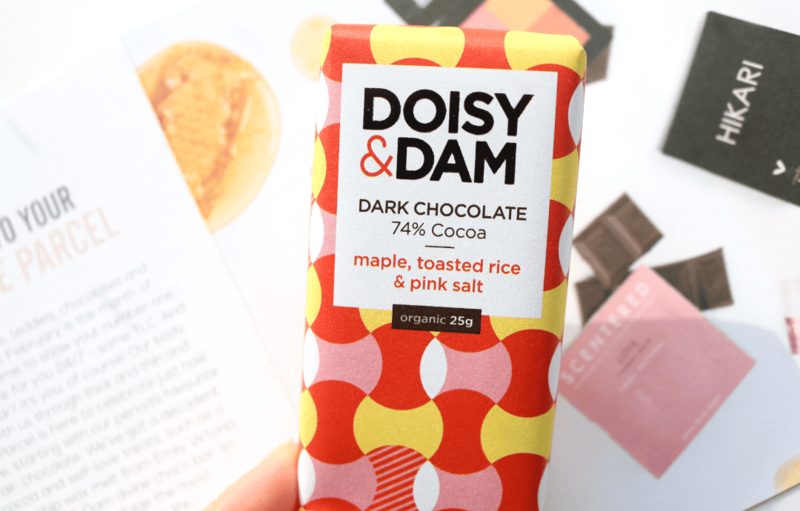 Pink Parcel always include the best sweet treats and I loved this mini bar of organic Dark Chocolate from Doisy & Dam. Blended with Maple Syrup, Toasted Rice and Pink Salt, it’s packed full of flavour and was just what I needed this morning! Oh my, if only you could smell this! It honestly smells exactly like chocolate and I wish I could eat it! 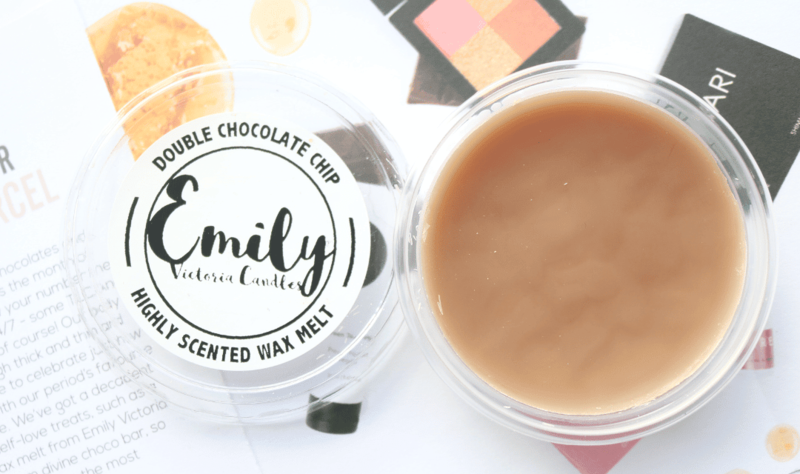 Instead, I’ve been enjoying burning this lovely Wax Melt from Emily Victoria Candles and it makes the whole of my living room smell like melted chocolate. Really impressed by the scent throw and quality of this one, so I’ll definitely be looking into buying some more of these in the future. 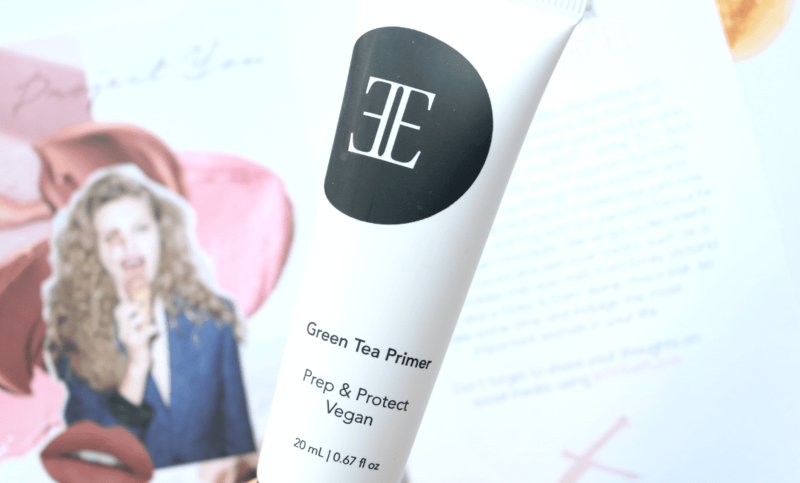 I adore sheet masks and regularly use them in my skincare routine, so I was happy to see one included in this month’s box – they are the best type of pampering treats! Vitamasques are a popular brand and this is their Manuka Honey mask which is perfect for dry or dehydrated skin as it feels very hydrating. Ideal for this cold weather that we’re currently experiencing. 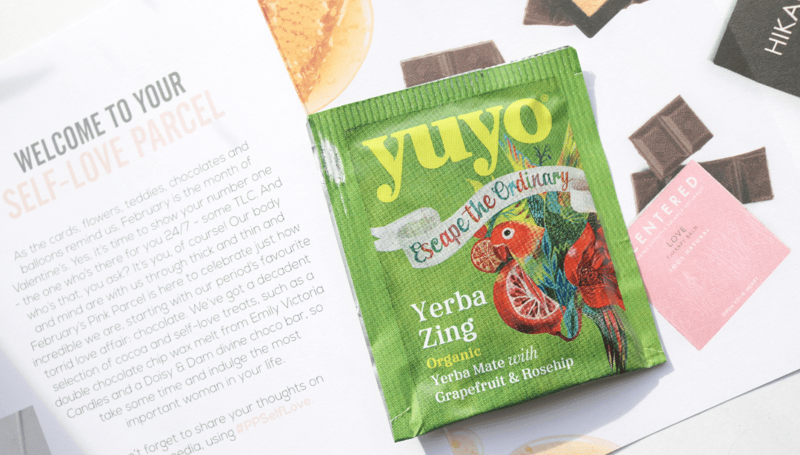 Lastly, I found a tea bag from one of my favourite independent tea brands, YUYO. I’ve tried this Yerba Zing flavour before and it’s delicious. It has organic Yerba Mate that’s blended with Grapefruit and Rosehip for an uplifting and refreshing cuppa. Yum! 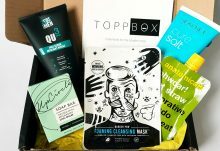 One of my favourite boxes from Pink Parcel so far and a fantastic mix of makeup, pampering and of course, femcare essentials, all in one handy box!